Lodo's has some of the best patios Colorado has to offer. Enjoy the views year round on our enclosed patio! Located on the first floor, this is a great space for a banquet event. It offers a variety of seating as well as plenty of space to stand and chat. Located on the first floor. 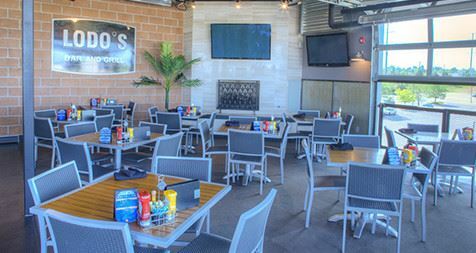 This patio offers comfortable lounge seating and a relaxed environment to suit your party's needs. This year-round enclosed rooftop patio offers the perfect mingling space for your party. Enjoy our high tops to stand or sit while enjoying the rooftop views. Located on the first floor, this area has plenty of TV's to fit your party's needs. There are also arcade games to provide extra entertainment to your guests. This was a great location and venue for my retirement party. Food and service was great, we got the larger room which worked out. A place where natural light, red brick walls, hickory floors and an exposed ceiling all come together to create a warm, inviting atmosphere perfect for your gathering. Wash Park Studio is a contemporary commercial photography studio/art space that’s perfect for special events requiring a unique setting with style, including weddings, receptions, corporate events, private parties, holiday gatherings, video shoots, fundraiser, and more. For evening events, you can determine the lighting that suits your style and even control the incredible, high-end sound system. Just bring your iPod and plug it into our sound system. And, our two bathrooms, fireplace and climate-controlled environment will make even the most discerning guest comfortable. Plenty of Parking, Close to Light Rail Plus, Wash Park Studio gives you the loft-style experience without the downtown parking hassles. There is plenty of free on-street parking around the building and the studio is only five blocks from light rail for alternative transportation. This breathtaking & BRAND NEW space showcases rock archways, wood-barreled corridors, a waterfront, grapevine trellis just to name a few of the features that will sweep any guest off of their feet and right into Northern Italy, upon arriving to your celebration. Deep Space Event Center is a Beautiful 7,500 sq. ft venue with art gallery in the Victorian area of Parker's Creative District. It has a Manhattan club-like Atmosphere that makes for unique and memorable events.